On the dashboard, Click the plus sign to create a new book. 2. Give your book a title, a genre and a description, then click Save. 3. Specify further details, such as feedback guidelines, copyright text, language, whether readers should be able to invite friends if they like what they read, and whether they should be able to leave feedback and book reviews. Then manage notifications you are interested in. 4. Add your chapters and surveys. 6. 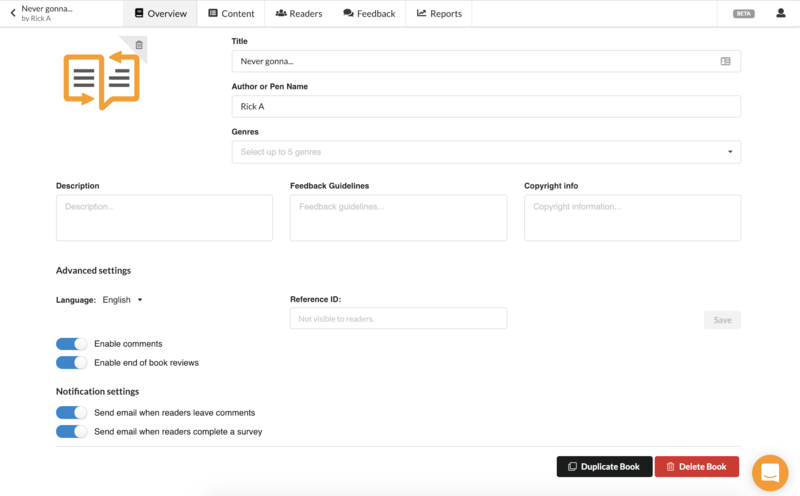 Watch the readers progress through your story via the reader reports, and respond to and categorize their feed under teh feedback tab.